Most pigs in the United States live indoors in crowded pens, but April Nugent has concentrated her studies on raising pigs in two natural, outdoor settings; she's researching the nutritional and animal-welfare benefits of a pasture versus a woodlot. Her work with several Gloucestershire Old Spots has also been a hands-on lesson in pig breeding and the business of livestock farming. Nugent began her studies of swine physiology and nutrition by working on the Hampshire College Farm, which has four breeding sows and produces about 70 piglets a year. When she proposed a study comparing raising pigs on pasture versus a woodlot setting, her mentors on the faculty and farm staff encouraged her to launch into independent research. To begin, they acquired several Gloucestershire Old Spots that had become available locally. The sows in her study began giving birth in early August, and the fourth will give birth this month. 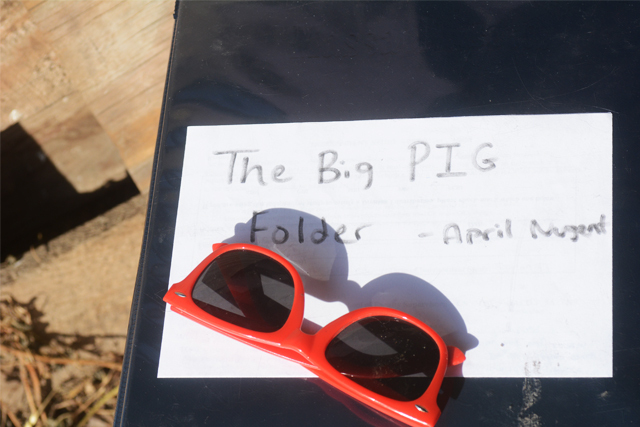 Nugent is studying the growth of the sows and piglets in the two settings. She said her initial findings suggest there’s a nutritional benefit for the pregnant sows to live in the woods; they’ve gained more weight there than did those on pasture. She’s still actively collecting data on the sows and the success of their litters, as not all the piglets have been weaned yet. Nugent would like to publish her final research in a scientific journal or an agricultural magazine. 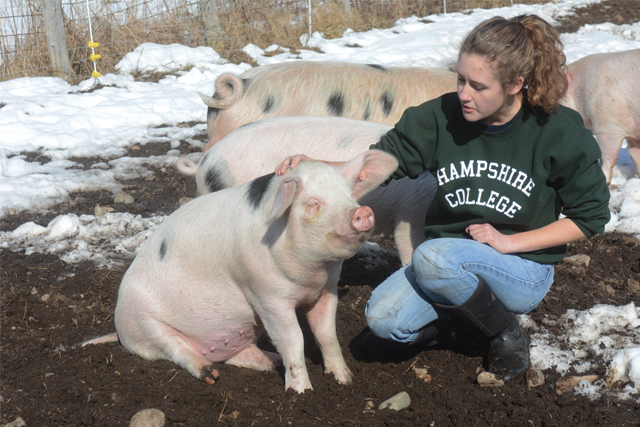 In addition to her studies at Hampshire, Nugent has taken courses on animal science and herd management at UMass Amherst through the Five College Consortium. And she’s been learning the business of livestock management. Her involvement with the Hampshire Food Systems Collaborative and the Farm Steering Committee has taught her a lot about budgeting. Nugent laughs. “I’ve made a lot of spreadsheets on profitability,” she says. She admits that the rough part of pig raising is always on her mind: The animals will eventually be slaughtered, and as deep an emotional tie as she has with them, she says she stays practical. Activist, sexuality educator, and “cancer warrior,” Ericka Hart will deliver the keynote at Hampshire’s Commencement on May 18, 2019.